Father and daughter relationships usually adopt a tunnel vision approach in theatrical history, and it is rare that we get an intuitive and insightful exploration. 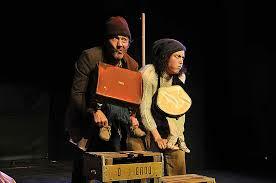 Crazy In Love deals heads-on with the tragi-comic tale of a vagabond father and his teenage daughter. This production from Conspiracies of Clowns is bound to be a Cape Town Fringe festival favourite, further validating its Best International Production award from the recent Amsterdam Fringe. The premise actually reads quite simply: Leon (Andrew Buckland) is left at the altar with his infant daughter, Ginny, in a state of disappointment. He sets off on a rocky quest to find his lost love. Fast-forward 15 years and we meet the ballsy Ginny (Liezl De Kock), now grown up to serve as her father’s sidekick and moral compass while joining him on his rollercoaster journey. Buckland’s Leon is not that likeable at all, at least not at first, which somehow adds ballast to a tale that might easily be dismissed as lightweight. While nothing novel, heartfelt or remotely surprising happens during the first 15 minutes, the production moves with a quicksilver fluency. Buckland’s portrayal is bang-on: he not only administers slapstick humour effectively, but also taps into a degree of self-laceration which plumbs the dark psychology of a man racked with failure. He plays it straight, which is exactly what a story of this extreme requires. Crazy In Love offers Liezl De Kock a challenging platform to display her versatility; she portrays both the nun and Ginny as strikingly individual characters. The nun, with her excessive mannerism, seems like someone plucked forcefully from a silent comedy of yesteryear. But De Kock’s whimsical Ginny impressively woos the audience with her vulnerability as much as her ebullience. Her pop-eyed glare and her Piaf-esque grimace give an extra sibilant disdain to the insults she lavishes. And in the closing scene, De Kock perfects a look both exceedingly pure and beseeching: the transition of a girl to a woman, whose capacity for loyalty, sacrifice and heartbreak is both off-putting and heart-rending. It is not only the actors who offer the Crazy In Love its expressive coherence. The remarkable direction of Rob Murray successfully unearths the savage comedy of this play as much as he pays articulate attention to the performances, pacing, and the use of space. Artistic director Jayne Batzofin spins a web of brilliance with some detailed and effective touches throughout the production, such as the ingenuous makeshift cart which also serves as a sanctuary, Ginny’s sacred shrine to her mother, and the transitioning costume pieces all of which contribute a great deal to the story. The red spot which signals Ginny’s onset of maturity can be paralleled against the populist significance of Dorothy’s ruby slippers in The Wizard of Oz, and will forever be etched in my mind. Above and beyond its accolade and its array of acclaimed industry players, Crazy In Love is a must-see production that succeeds in offering a remarkable visual impact with real physical swagger. Crazy In Love runs at the City Hall from 25 to 29 September 2014 as part of the Cape Town Fringe Festival.